For the past ten years, PROTECS Inc. has helped companies grow by providing design-build and construction management services. By providing an end-to-end suite of integrated services, PROTECS directs and delivers complex, purpose-driven commercial spaces for innovators across high-tech and corporate sectors. Headquartered in Plymouth Meeting, Pennsylvania, PROTECS also manages offices in Newark, Delaware and Bridgewater, New Jersey. Leveraged Design-Build frees clients from management complexity and the growing burden of risk, shifting responsibility to PROTECS as the project delivery experts. PROTECS acts as the single point of contact throughout the entire project lifecycle, collaborating closely with owners and outsourced partners at every step to unify all parties under the same objectives and facilitate a highly efficient and focused design and construction process. PROTECS uses its streamlined Leveraged Design-Build method and patented Target Costing approach to reduce the time from inception to build by 40 percent and guarantees its clients the best price for each project. By working diligently to align functional, compliance, aesthetic and budgetary parameters from project inception, PROTECS ensures that each design follows performance and cost parameters to eliminate the need for expensive re-engineering cycles and time overruns. Throughout its ten-year existence, PROTECS has consistently evolved and adapted to changes in the industries that it serves. “We have a highly leveraged approach to designing and building that is both efficient and cost-effective for our clients,” says Chris DiPaolo, president and founder of PROTECS. PROTECS has established solid, long-lasting relationships with the companies in their portfolio. Due to the satisfaction of current and past clients, 80 percent of the company’s revenue is due to repeat business. PROTECS has established a niche market being the only firm to provide Target Costing while also assisting in site selection, master planning, design, construction, commissioning and validation on small, mid-size and large projects. A recent endeavor that highlights the multiple capabilities of PROTECS was its involvement in a $20 million project to relocate a large chemical company. “We moved them to 212,000-square-foot facility to accommodate approximately 500 people,” recounts DiPaolo. “We lead the site selection process, designed it, built it, commissioned it and moved 500 people and 2,000 pieces of R&D equipment in a fast-track project delivery manner. 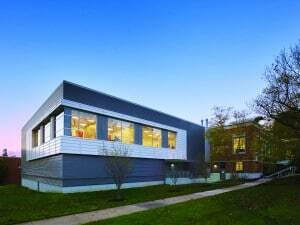 It was a great example of the full line of services we offer our clients.” Other projects recently added to PROTECS’ expanding resume include state-of-the-art – compounding pharmacies, stem cell manufacturing facilities and a nanotechnology center for University of Pennsylvania and Columbia University. Working with companies involved in bio/pharmaceutical, medical device, chemical and semiconductor industries, involves extensive knowledge and awareness of constantly evolving rules and regulations in regards to handling, processing and transporting chemicals chain of custody, drugs and devices. Through its experience in these industries, PROTECS is well versed in the policies and procedures, which permits the company to accurately estimate the costs of such process intensive operations. As a company that began targeting high-tech companies, PROTECS has proven its ability to expand throughout multiple markets. The company will continue to exploit its unique project delivery approach and construction management expertise that will extend it past three years of substantial growth in regard to employees, revenue and geographical footprint. “In the future we plan on collaborating with more universities,” says DiPaolo. “Universities and even hospitals are expanding and developing spin-off technology companies but look to the expertise of companies like PROTECS to provide the best environment to promote growth and collaboration. That’s something we’re looking to do nationwide.” PROTECS will also be opening a West Coast office soon, which will assist in its national business practices as the company remains a trusted project delivery partner for clients of all sizes and sectors.